While procrastinating about dinner this evening, I was hunting for a spot to move a couple of beleagured blueberries. Procrastination being what it is, I found myself pulling a weed or two from the beds in the backyard. That’s curious, I thought. 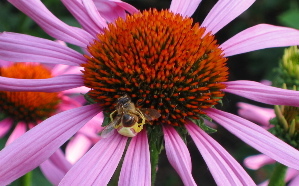 A bumblebee grazing on this echinacea and a honeybee right next to it, as still as could be. Yeah, ’cause it’s dead, I guessed. Right I was. A closer look showed that it was in the grasp of a spider I’d never seen before: white body with pink stripes along its abdomen and pale greenish legs. 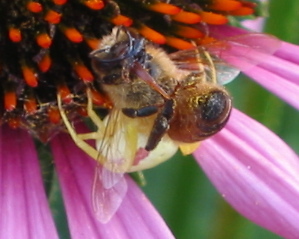 It was hard to photograph, but you can see the body (the spider’s head seems to be buried inside the former mr bee, sucking its innards out) underneath the bee. Cool.